When you possess one of the greatest, most unique and powerful voices in music it can be difficult to find your own sound and style. Thankfully, Kevin Galloway discovered what his true style during his Uncle Lucius days. 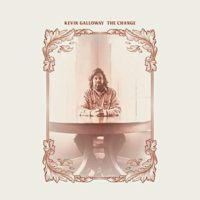 With his debut solo record, The Change, Galloway has refined that sound, tamped down the jam-bandy aspects, honed in on the country, turned up the soul and cranked out a gem of an album that is one of the year’s best (at this juncture, the best) and a testament to the self-described Gulf Country Soul sound he was seeking. Galloway’s powerful vocals drive each song and provide them the proper gravitas to match the lyrics he has strained from his real life’s experiences. These songs are unmistakably positive and affirming. Galloway is at peace with his place as an artist and his place as a man, father, husband. Those elements have never failed to make a great record. “Don’t It Feel Good To Smile” proclaims how good the life he’s found is and in it there’s a piece of each of our lives striving for satisfaction. It’s a knowing contract with perfection that we’ll never achieve, but know that just working on it is just fine. Galloway is confident, romantic, soulful, thoughtful and commanding. Allman-esque guitar solos have been replaced in some aspects with copious, but tasty use of steel guitar and keys. It’s a balanced, country sound that evokes Don Williams with Otis Redding’s voice. In fact, that’s a good description of this entire project. It’s as if some country songwriters got together and threw their best work into one album and then called up the best soul singer they could think of to sing the hell out of it. Just so happens, those songwriters and that singer are one in the same, Kevin Galloway. This album is a love letter to Galloway’s wife, life and music. We should all be thankful that artists like Kevin Galloway open themselves up enough for us to go along for that ride too. Hiya, I’m really glad I’ve found this information. Nowadays bloggers publish just about gossips and web and this is actually frustrating. A good web site with exciting content, this is what I need. Thank you for keeping this site, I will be visiting it. Do you do newsletters? Can’t find it. Great remarkable things here. I¡¦m very glad to look your post. Thank you a lot and i’m looking ahead to touch you. Will you kindly drop me a e-mail?